The new and exciting non-silicone, non-structured, extremely comfortable breast form created especially for you. This patented breast form is cool, soft and supple -- not hot and sticky. It can be worn in almost any bra. When worn directly next to your chest, it fits naturally into the contours of the chest wall; giving the feeling of being part of you, taking on the shape of your natural breast. The therapeutic bead filling is non-structured so it can respond to a woman's continuous body movements contributing to her natural appearance and feeling of balance. Additionally, the form readily shapes to the contours of the chest wall. The Therapeutic Bead Breast Form has been designed to aid the healing process related to a mastectomy. When placed directly on the chest wall, a degree of massaging action takes place as a result of normal movement of the wearer. This massaging action aids in the flow of oxygen carrying blood to the surgery site instead of restricting it. Also, because the beads are constantly moving, air is circulated around the area, efffectively preventing buildup of body heat, resulting in a cooler form. All of this aids in a rapid recovery. The Jillianna form feels so comfortable and natural. It looks and feels wonderful! When I put it on, it just feels like a natural part of my body. I have just recently had my surgery and would never have imagined such a thing was possible! The After Surgery Fluff. (OA, TA) This is the lightest, having very little weight. The slight weight helps keep the form from moving around and riding up. This form is ideal for right after surgery. The LightWeight Form. (OL, TL) This form is for women who prefer a light weight breast form. The Medium Weight. (OM, TM) This form approximates the weight of the natural breast and provides a more natural fit. The Partial. 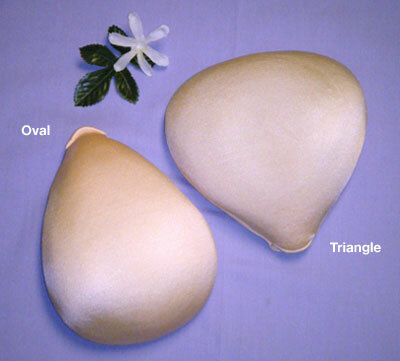 The oval shell (OS) and triangle shell (TS) are for women who have lost part of their breast.